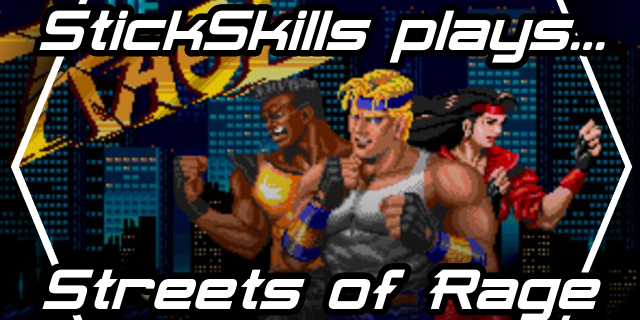 Ross has probably pronounced his love for Streets of Rage somewhere between one million and one billion times, and I finally got tired of hearing it. And by “got tired” I mean “bought the game on the spot”. Often after the StickSkills Radio podcast is over we all sit around and talk as though we’re actually friends or something. The podcast needs to be a reasonable length and have a decent amount of focus so you don’t chop your heads off in boredom while listening, however this video or rather series of videos will hopefully provide the nonsense of StickSkills Radio with the distraction of a video game being played. That way, nobody has to die. This episode features the cast of episode 32 with Ross and myself playing with a brief couple of yucks from Perry and some random words from Chris Hague. Just like on the podcast. Don’t forget to check out the rest of the content on the StickSkills youtube channel, StickSkillsTV. Thanks for watching!